It’s a quandary that often faces travelers to ecologically fragile destinations: tourism can do wonders to raise awareness about the importance of conservation, yet visitors may question whether their very presence is contributing to a problem. For visitors to places like the Galapagos, it’s essential to travel with as light a touch as possible, in small groups via low-impact means. The committee took action in a 15-to-4 vote during its 34th annual meeting in the Brazilian capital of Brasilia. The volcanic archipelago off the coast of Ecuador had been placed on the World Heritage in Danger list in 2007 at the request of the Ecuadorian government, who sought greater international attention for the islands’ plight. Blue-footed booby. Copyright Wendy Worrall Redal. The vote to ‘de-list’ the Galapagos – designated a World Heritage Site in 1978 — reflects the committee’s recognition of the efforts made by the Ecuadorian government to preserve the islands’ unique natural heritage. They are perhaps best known as the inspiration for Charles Darwin’s theories about natural selection, spawned when he visited the Galapagos in the 1830s and discovered fascinating variations in species as he sailed from island to island. But not everyone believes the Galapagos are ready to be taken off the list. The International Union for Conservation of Nature (IUCN), which initially suggested listing the Galapagos, opposed the vote. The IUCN recognized improved efforts by the Ecuadorian government to slow, if not stop, illegal fishing, but a press release from the organization says “IUCN is concerned by this removal because despite progress, the islands are still threatened by serious conservation problems, including invasive species. 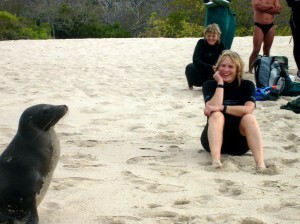 Me, enjoying our Galapagos sea lion visitor. 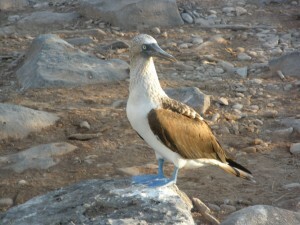 Regardless of the Galapagos’ formal status, it remains crucial for visitors to choose responsible travel providers for their adventures in this unique habitat. With Natural Habitat Expeditions, for instance, you don’t travel on a ship and step ashore with a hundred people – groups are never larger than 12, we sail between islands on a catamaran, and we explore via intimate means – what closer way to encounter the incredible marine life of the Galapagos than by kayak? 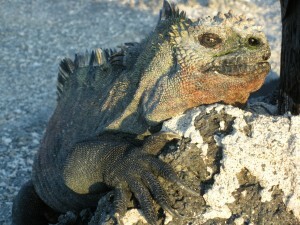 Check our website for details on our Galapagos trips. And if you’d like to read more about the UN’s list of World Heritage Sites – in danger, or otherwise – visit UNESCO’s World Heritage web page. Thanks for that kind offer, Patrick! Quito would be an amazing place to live. And all the geographic diversity within a few hours of the city in any direction… Fortunate you. Thanks for reading.